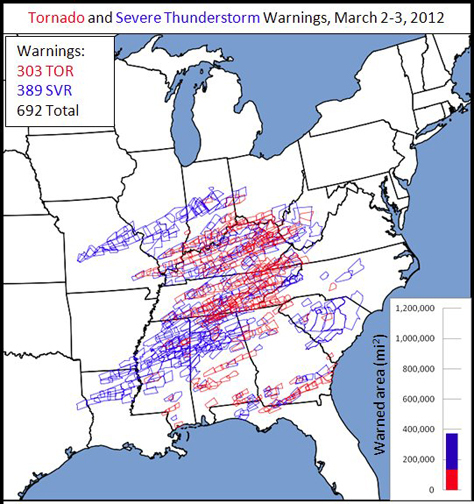 Roaring through the Ohio and Tennessee Valleys this past weekend, tornadoes claimed the lives of forty people across five states. This was one of the deadliest March tornado outbreaks in the U.S. since 1950. At this point, the National Weather Service has confirmed forty-five twisters in eleven states. This number, however, is likely to rise as damage investigations continue. The strongest storm in this widespread outbreak was rated an EF-4, the second highest ranking on Enhanced Fujita Scale. With winds of 175 mph, it devastated the town of Henryville, IN. Another hard hit area was West Liberty, KY. An EF-3 storm, with winds of 140 mph, is reported to have charged through the town’s main street, destroying everything in its path. Tornadoes, nature’s most violent storms, are spawned by severe thunderstorm activity. They can occur anywhere in any season, given the proper conditions. That said, they are more typical in the spring, when the atmosphere is transitioning from cold winter weather to summer warmth. With the spring equinox just around the corner, this tornado season is only getting started. Unfortunately, more severe weather is likely in the coming months. This entry was posted in weather and tagged extreme weather, national, seasons, storms, tornadoes by Melissa Fleming. Bookmark the permalink.